1950s' coach tours by United Automobile Services Ltd of Ashington. Homepage. This page: A simple printed leaflet advertising the luxury coach tours offered by United of Ashington. 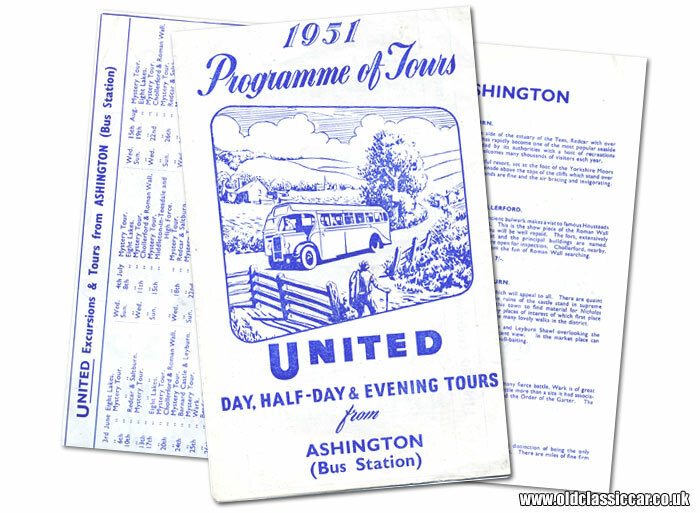 This simple leaflet describes the motor-coach tours planned for 1951 by United Automobiles Services Ltd of Woodhorn Road, Ashington. The cover features an illustration of an idyllic rural scene, a small half-cab coach negotiating a winding country lane, watched by a local out for a stroll. By this time, 1951, rationing of motor fuel for the general public had recently come to an end yet for many people, their only opportunity to visit the countryside and escape, albeit temporarily, the big towns was either by coach tour, or the railway. The tours in this publication ran from the 3rd June through to the 30th August, although presumably tours prior to, and after, this period were also on offer. Day, half-day, and evening trips were included in their itinerary, and Mystery Tours were run regularly. Destinations listed in the leaflet included Ravensworth Castle, or rather the remains of it, for which 4/6 would be charged for this evening trip. Day trips to Middleton-In-Teesdale for example, would have relieved each passenger of 9/6, while an afternoon trip to Wark would have cost 6/-. Is this company related in any way to United Motor Services, of Rotherham and Sheffield?